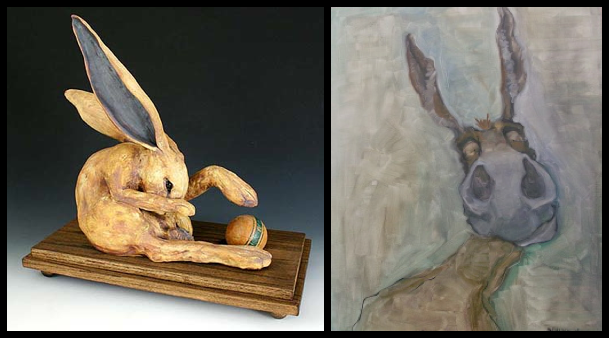 The worlds of Diane Hanway and Julie Kradel merge in this whimsical show of cunning rabbits, demure cats and other curious critters. It's guaranteed that Animal Menagerie will make you smile. Diane Hanway is an professional oil painter from Marshall, Michigan. Her works are inspired by the everyday antics which transpire on her small farm which is the home to horses, cats and dogs. She has two Bachelors degrees, one general studies degree with a concentration in marine biology and a B.A. in Fine Arts from the University of Michigan. Diane has been an exhibiting artist at Cycling Salamander since 2001. Julie Kradel has transformed her love of animals into her clay sculptures and tiles. Her works have received praise and awards at juried fine art fairs across the country and are included in many of the best galleries. She resides in Cedar, Michigan with fellow artist/partner, Steve Kostyshyn.